Almagro International Theatre Festival. Photo: J.Alberto Puertas. Almagro is Spain’s largest and oldest classical theatre festival, bringing fifty-two productions to this small, picturesque town in Castilla la Mancha for its 40th edition. Five productions from Spain’s Compañia Nacional de Teatro Clásico (CNTC)—one of the festival’s most consistent visitors—were seen this year: La dama duende (The Silly Lady) and El perro del hortelano (Dog in a Manger) at the Hospital de San Juan (the Hospital of St. John, effectively their house venue) and La judia de Toledo (The Jewess from Toledo), Sueños (Dreams–a compilation of works from Quevedo), and Fuente Ovejuna at the Antigua Universidad Renacentista (the old Renaissance University). Fuente Ovejuna, the comedia with the strongest performance history in recent times, was presented by the CNTC’s young company of actors, adapted by Alberto Conejero and directed by Javier Hernández-Simón. It is an energetically paced production with a melancholy air that seems particularly well suited to our sombre times. Bengoa Vázquez creates a semi-circular set that evokes both a bullring and an animal enclosure. The gates raise and fall with something of the ominous sound of a falling guillotine. The open space allows for quick and fluid movement. Miguel Ángel Amor’s King Ferdinand and Raquel Varela’s Queen Isabella glide across the peripheries of the action, floating as if on air across the wings and then the back of the stage. Their regal status is demarcated from the production’s very inception. In contrast to the quick movement of the villagers, darting to escape the bulls and battering rams which the company also embodies, the monarchs move like gilded spectres, their ornate trains trailing behind them. Hernández-Simón creates a veritable sense of the villagers as a community. The young performers move in and out of roles—from villager to animal, from individual to chorus member—suggesting a synergy with nature that escapes Jacobo Dicenta’s imposing Commander. Indeed, it is almost as if the Commander is in a different production, an outsider in every sense of the word, moving to a different rhythm than the rest of the twenty-two-strong cast. This difference is heightened through Beatriz Robledo’s costume design. The villagers are clad in cream, brown and olive green—earthy colors that reinforce their association with the land. Dicenta hovers ominously over the proceedings in buttoned up black and burgundy, inspiring panic as the villagers attempt to lock up their daughters every time his predatory figure appears on stage. The shutting away of the women in the pen tells something of how the Commander sees them—as animals. Paula Iwasaki’s Laurencia has a suitably rasping voice that distinguishes her from the crowd, a forceful presence standing out from the rest of the villagers. The direction often singles her out, pushing her out to potent effect. The production’s lithe choreography gives Fuente Ovejuna a palpable sense of urgency. Marta Gómez’s movement direction has the villagers move forward like a giant wave as they dance towards the audience. They divide into small groups to shield the women as the Commander and his entourage approach. Álvaro Renedo’s music builds on the percussive tone of the verse delivery. At the production’s end, the resolution doesn’t quite bring easy closure. Ferdinand and Isabella may offer judgement, but hovering around the peripheries of the action through the entire production, they remain all too distant from the population they govern. Dressed in opulent red and white gowns that contrast with the simple cut of the Fuente Ovejuna villagers, they provide an image of a distant sovereignty, far removed from the everyday life of the populace. The staging’s final image does nothing to dissuade the audience from this thought. María Inés Calderón (1611-1646), known simply as La Calderona, abandoned soon after birth on a doorstep, went on to become one of the most celebrated actresses of the day. Upon making her debut at Madrid’s Corral de la Cruz in 1627, she attracted the attention of Philip IV, eventually mothering his illegitimate son, John Joseph of Austria. Forced to give him up soon after birth in 1629, she was later made to enter a convent in 1642. She remained a nun for the rest of her life, rising to the position of Abbess before her death in 1646. These key episodes serve as the springboard for Yllana’s La Calderona, a rough and ready run through her life story with accompanying musical numbers, premiering at the Corral de Comedias, the best preserved seventeenth-century Courtyard Theatre in Spain. 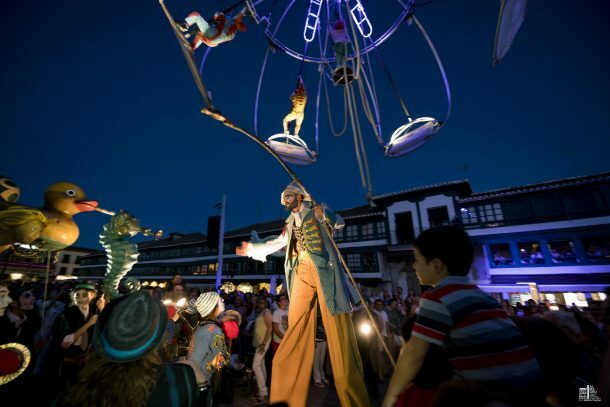 The company Yllana, co-founded by the current artistic director David Ottone in 1991, are known for their popular comic spectacles, and La Calderona is no exception. This romp, presented with a hip-hop soundtrack, does not really tell the audience anything new, offering a crude, saucy spin through her life that provides a dose of romantic melodrama to counterpoint the Carry On-like antics. The relationship with King Philip IV conveniently bypasses his abusive treatment of his mistresses – flaunting them in front of his wife Queen Isabel of Bourbon. The fact that La Calderona was married and already mistress to the Duke of Medina de las Torres is also largely overlooked. DJ Hardy Jay offers a pulsating rap rhythm to the action while Natalia Calderón and Pablo Paz jump across different roles with a judiciously chosen prop or quick costume change to announce the shift of character. The in-yer-face, blowsy costumes pay a nod to historical conventions, merging period design with track suit nylon and training shoes. The equation of actresses with prostitutes is a familiar trope covered by Natalia Calderón in one of her upbeat musical numbers. There’s excessive exposition in Rafael Boeta’s script as each character explains to the audience who he or she is without much thought to dramatic economy. This is in many ways a conventional musical with song numbers used to articulate moments of intense emotion, intimate revelations, and high drama. The wonderful Corral de Comedias, constructed in 1628, offers some appropriate locations for the action with minimal décor—such as the DJ’s desk—added to the theatrical architecture. Philip IV watches La Calderona perform from a first-floor balcony, evoking the structure of Madrid’s Corral de la Cruz, while La Calderona and the Queen do battle in a boxing ring-like arena created in the central acting space. David Ottone takes responsibility for the direction and design. Natalia Calderón and Pablo Paz in David Ottone’s La Calderona. Photo: J.Alberto Puertas. The play covers a number of the myths about La Calderona; that the mountains outside Valencia are named after her; that she left Madrid and joined a gang of bandits in a bid to escape Philip IV. The play’s final section set in the convent in Guadalajara, where Philip IV had her taken to remove her from the public sphere, allows for a saccharine-sweet mother-son reunion scene, complete with a Whitney Houston-esque show tune. The opening night audience clearly enjoyed the fusion of melodrama, historical romance, and hip hop, with loud applause greeting the final number and much laughter engendered by the slapstick antics and sassy physical comedy. Festival director Natalia Menéndez and her programming team have brought fourteen companies from outside Spain to the festival this year. These include Jerusalem’s Khan Theatre, visiting Spain for the first time with a smart, reworked version of Molière’s Scapin the Schemer, which has been in their repertoire since 2009. An opening prologue, sung by Vitali Friedland’s Scapin, sets the scene, playfully introducing the different characters as each comes on and nods to the audience. From the very opening this Scapin adroitly controls the ensuing action. Characters walk on in the sung prologue only when he calls them up. Dressed in a cropped pair of black trousers and red lined tails, with a quiff that wouldn’t look out of place on Edward Scissorhands, this lean and lanky Scapin looks like a pasty-faced clockwork doll. There is something cartoon-like in Dana Tsarfaty’s bright and bold costume design, the actors standing out against Frida Klapholz-Avrahami’s white box set. There are the young men in love. Ariel Wolf’s Liandre, in black shiny jeans and matching shirt, boasting a large burnished metal cowboy belt and bright red neck scarf, rushes on and off stage as if skiing. His demi-quiff is styled with a part pony tail that bounces as he darts and dances. Yoav Hyman’s Octave, with a lopsided haircut, can’t quite cut the Alpha male, crumbling like a flaky biscuit whenever things don’t quite go his way. Their respective love interests also provide dynamic contrasts. Nili Rogel’s Zerbinette has green and red streaked hair, a matching flamenco dress, and ripped tights that would not look out of place in a fairground show. She bounces on stage in black doctor martins, dancing across the space with gleeful abandon. Natalie Eliezerov’s Hyacinthe is an altogether more delicate figure, moving as if dancing on tip-toes in a pastel-pink dress adorned with black lace and a delicate bow in her hair—the oh-so-feminine look broken by satin yellow gloves that point to a steely disposition. The ageing patriarchs also present divergent images of establishment power. Arie Cherner’s Argente is rotund, wobbling with a walking stick like a giant toddler with a tuft of balding hair; the baby blue collar and cuffs on his jacket suggesting something of his infantile character. Yehoyachin Friedlander’s Geronte is a leaner, meaner character with a buttoned up black jacket and a head that leans out of his suit in creepy, reptilian fashion. The red accessories link him to his son; with Argente and Octave too, father and son are identified through a shared use of blue—Octave’s blue tie complementing the blue trimming on his father’s jacket. Erez Shafrir’s Silvestre is dressed in a greyer version of Scapin’s outfit; the jacket more compact and fitting with a pseudo-Bavarian hat to match. The characters in Udi Ben-Moshe’s Scapin the Schemer, presented by Jerusalem’s Khan theatre are introduced by Vitali Friedland’s Scarpin. Photo: J.Alberto Puertas. If Vitali Friedland’s Scapin oversees the action with an MC’s sense of control, Shafrir’s Silvestre proves a more elusive proposition, appearing in a range of different disguises as the narrative requires. As Scapin explains the intricate plot, with adoptive parents perishing and daughters lost, Silvestre takes on the different roles at breakneck speed: as Hyacinthe’s adoptive mother on her death bed, head swaddled in ornate pastel pink bed cap; as Zerbinette’s avaricious brother grunting expletives as he swigs from a beer can and leans over the intimidated Argante, who hands over the funds to keep the aggressive mercenary at bay. Scapin’s swindling of both fathers out of funds to help their sons keep their loved ones is orchestrated with a Marx Brothers-like comic timing. Geronte’s hiding in a bag to escape what he thinks is Zerbinette’s brother has Scapin take on the brutish brother and the put- upon servant in a duel recreated vocally to scare Geronte into submission. The baseball bat used to punish Geronte gets ever larger, Scapin wielding it with a gleeful sense of mischief until he’s caught out as a result of his own effusive enthusiasm by the miserable Geronte. Translator Nathan Alterman has stripped the play down to keep the action taut and tight. There is no Nerine here—Hyacinthe’s wet nurse—and scenes are narrated in order to keep the plot moving swiftly. Scenes that too often linger in production –as with Scapin’s manhandling of Geronte hiding in a bag to escape what he thinks is Zerbinette’s violent brother – are here realised with the timing of slapstick comedy. Humour derives from actions that are often simply narrated in the play. Indeed, one of the production’s funniest scenes has Zerbinette’s foster family dancing on and off stage with jewellery dangling off their gypsy costumes. Udi Ben-Moshe’s Scarpin the Schemer, presented by Jerusalem’s Khan theatre. Photo: J.Alberto Puertas. At the play’s end, Scapin rises from the wheelchair in which he has placed himself, feigning mortal injury to evade punishment from Argente and Geronte, to offer a reprise of the jovial opening song where once more actors are credited for their roles, Molière is identified by his given name Jean Baptiste Poquelin, and Nathan Alterman is repeatedly and amusingly acknowledged as the play’s translator-adaptor. Too often translators are erased from the production credits, here he is joyfully celebrated as a key part of the production. Director Udi Ben-Moshe succeeds in finding a gestural language for the production that acknowledges the play’s debt to commedia dell’arte without ever falling into well-worn stereotypes. There’s a freshness here in the lively pacing and innovative physical language. The female characters are gloriously uplifting, as agents of their own fortune. Octave and Hyacinthe roll about the floor kissing as Leandro and Zerbinette stand tall and snog. The vertical and the horizontal are repeatedly used to stretch the action in unexpected directions, creating pockets of action while keeping the pacing brisk. Scapin the Schemer provides an energetic ninety minutes of seamless slapstick, merged with a retro pop aesthetic and a fine sense of comic timing – a reminder of how bitterly cutting Molière’s work can still be. There have been many Macbeths over the years but probably none quite like Companhia do Chapitô’s three-hander, which played at the intimate Patio de Fúcares. 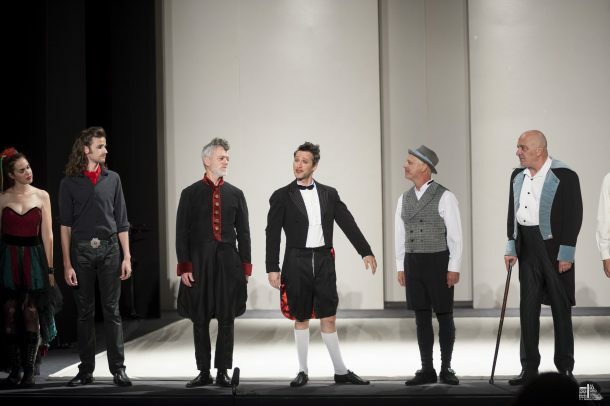 Actors Jorge Cruz, Duarte Grilo, and Tiago Viegas provide an eighty-minute reading of the play as wry comedy armed only with three kilts, matching shawls, a smoke machine, and three microphones on stands. The shawls are deployed to full effect as the actors taken on the role of the witches, using the microphones to create the eerie sounds of spectral disorder. The smoke machine provides accompanying visual effects that point to the knowing element of play that the Portuguese company uses to create a sense of complicity with the audience. Stage machinery is knowingly operated to create mood and atmosphere. Sonic effects (from death cries to wildlife in the woods) are created through microphones. Music is switched on from the onstage sound system. Shawls are whisked off and kilts moved up and down the body to signal a shift of character. This is a production where character and actor never fuse. Rather, any one of the three performers can take on the roles as necessary and appropriate. A kilt pulled up to an actor’s upper torso evokes Lady Macbeth; lips purse and eye brows arch to indicate the character shift. Sweeping his head to one side, he indicates her contempt for much of the court around her. Gender is performed to powerful effect by this company. Microphone stands are pulled apart and reconfigured to create the horses on which Macbeth and Banquo ride, and later to create Birnam Wood. A swing for Lady Macbeth to sit on is crafted from the amp and the microphones. The gates of the castle are hastily constituted from twisting the mic stands and wires. Microphone stands split into two to function as deft swords and knives, and in the final moments of the play twisted together with a shawl combine to create bagpipes. The confessional culture of our times is also a feature of the production: characters are interviewed about the ensuing action, fulfilling the role of the play’s choral parts by commenting on events and their implications. Everyone wants to know about motivations and intentions, and the private spills over into the public sphere on numerous occasions as a microphone is thrust into a minor player’s face and he or she is asked to speak about the implications of a certain event. This is a Macbeth for an age where the private spills over into the sphere of the confessional and nothing is deemed too sacred or to secret for commercial exploitation. Companhia do Chapitô, Macbeth. Photo: Companhia do Chapitô. Do Chapitô’s Macbeth is very funny, and the sheer energy and pace of the production keep the audience on its toes. The three actors bounce across the stage with physical dexterity and a nimble sense of movement and choreography, weaving a narrative line through the play to ensure that the plotting remains clear. This includes filling in ellipses, explaining the play’s more incongruous elements, and setting the scene for grand set pieces. It helps if you know the play as there are witty references to its stage histories—actors stepping briefly out of role to comment on a scene’s importance—as with Lady Macbeth’s sleepwalking sequence—and to some of the play’s gender politics—as with the limited appearance of Lady Macduff. At Almagro, Macbeth played at 1:00am, as part of the After Classics late night program at the Patio de Fúcares. (The summer heat in Almagro means that audiences are reluctant to step into a theatre before 9pm, while the local economy is boosted by the hotel stays that are central to locals getting behind the festival). The packed house relished the clowning, gameplay, and innovation. Macbeth is a whirlwind of a show, a rollercoaster ride realised with verve and ambition. There may be little reverence here (for which I was glad), but there is respect and an engagement with the text that is genuinely exciting. Directed by John Mowat and José Carlos García, Macbeth is more jazz riff than clean staging, but its stagecraft and sense of vocal delivery could teach an established company or two something of what it means to turn a seasoned classic into a genuinely thrilling theatrical event. 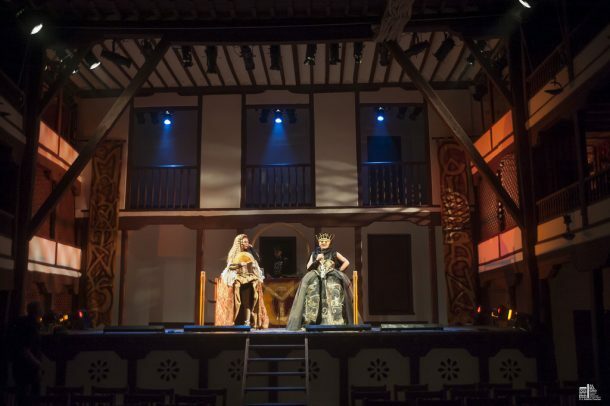 In addition to its After Classics strand, the festival presents a competitive Off-Almagro grouping of productions that bring in newer companies undertaking adaptations of early modern plays with an experimental edge. Work programmed at the la Veleta theatre on the outskirts of the town included Marc Chornet’s Romeo and Juliet and Itxaso Larrinaga’s adaptation of John Ford’s Tis a Pity She’s a Whore – a more unusual addition to their habitual programming trends. Every Sunday at 1:00pm, there’s a chance to share a vermouth cocktail while listening to a group of Almagro veterans—actors, local audience members, technicians, and journalists—sharing recollections and anecdotes. Vermú de las 40 (Vermouth at 40) offers oral history in the making through the very Spanish convention of the tertulia—a social gathering with a literary or cultural dimension. All credit goes to the festival for ensuring that spectators form part of the tertulias, discussing what it means to engage with the productions as audience members. Certainly at the Vermú I attended on 23 July 2017, it was the audience member who stole the show, regaling us all with her memories of 40 years of theatregoing in Almagro. Audiences also revelled in the solo performances titled Sabores del Quijote (Tastes from Quixote), some of the 20+ free events offered as part of the festival and linked to the town’s tourist industry. (Statistics show that those who come for the festival often return to the picturesque town over the course of the year). Here two local chefs prepared dishes referenced in Cervantes’ Don Quixote. Lasting an hour each, Víctor García Chocano and Jesús Villajero offered two different approaches for thinking through how to convey their passion for cooking. The jovial, rotund García Chocano looked as if he might have stepped out of one of Cervantes’ entremeses (interludes) regaling the audience with tales of his exploits in the kitchen, of the secrets of chopping onions and keeping customers happy, the challenges of wedding parties, and the influence of his mother-in-law on his approach to life. Villajero represents a new minimalist cuisine where anecdotes are replaced with variations on classic dishes—as with a salt cod and potato purée used as the base for series of canapes and main course. Audiences even got to take recipe cards home with them to try out making the dishes at their own leisure—a memento that further evidences the phenomenon that chefs are now celebrities with their own trademarks and wares. Part of Almagro’s charm lies in the different ways in which spaces are reappropriated for performances and events: Tastes from Quixote was held in the Cloister of Almagro’s Theatre Museum while the old Hospital de San Juan played host to the two Helena Pimenta productions presented by the CNTC. This is a town which comes to life as the different spaces, from the old Renaissance University to Santo Domingo Square and the Hermitage of St. Ildefonso-La Paz, are animated by the different visiting performances. Almagro, the place where Almodóvar’s Volver (2006) was shot. may have its own Municipal Theatre—hosting Carles Alfaro’s production of Life is a Dream during my stay—as well as the Corral de Comedias, but the festival paints the entire town as a stage where performance lies around every corner and the early modern repertoire and its protagonists are refashioned for different audiences. One of the highlights in the Apartes installations, “Solo vine a ver el jardín” (I only came to see the garden) by Alicia Martín, had a tree adorned with different books, a plethora of texts layered across history and culture. This year, 70,000 visitors attended the festival with ticket sales up 8.34% from the previous year and a record-breaking 98.2% occupancy. The commitment to showcasing work from across Spain was evidenced in the presence of thirty-six companies from across nine different autonomous regions, from Catalonia to the Basque Country. Madrid and Castilla la Mancha were also well represented with Alfredo Sanzol and Andrés Lima bringing two recent acclaimed co-productions between Teatro de la Ciudad and Teatro de la Abadía: La ternura (Tenderness) and Sueño (Dream). The international presence saw work from Argentina, Brazil, Canada, Chile, Colombia, France, Germany, Greece, Rumania, and the UK, as well as Israel and Portugal. From Purcărete’s large-scale Julius Caesar to Erike Busoni’s intimate ShakesPirando, this is a festival that celebrates diversity. Actress turned programmer, Natalia Menéndez has announced that after 8 years she is resigning as Artistic Director of the Almagro International Theatre Festival. She’ll be a hard act to follow. Maria M. Delgado is Professor and Director of Research at The Royal Central School of Speech and Drama, University of London, and Honorary Fellow of the Institute for Modern Language Research at the University of London. Her books include “Other” Spanish Theatres: Erasure and Inscription on the Twentieth Century Spanish Stage (Manchester University Press, 2003, updated Spanish-language edition published by Iberoamericana/Vervuert, 2017) and Federico García Lorca (Routledge, 2008), and the co-edited Contemporary European Theatre Directors (Routledge, 2010), A History of Theatre in Spain (Cambridge University Press, 2012), and A Companion to Latin American Cinema (Wiley-Blackwell, 2017). She has published two collections of translations for Methuen and is co-editor of Contemporary Theatre Review.